0207 213 9550 hello@primasmedispa.com6 Ludgate Square, Ludgate Hill, London, EC4M 7AS. The average woman shaves 7,718 times in her life time, who has that time to waste? Gain confidence and get Summer body ready at Primas Medispa; Advanced laser hair removal in London. 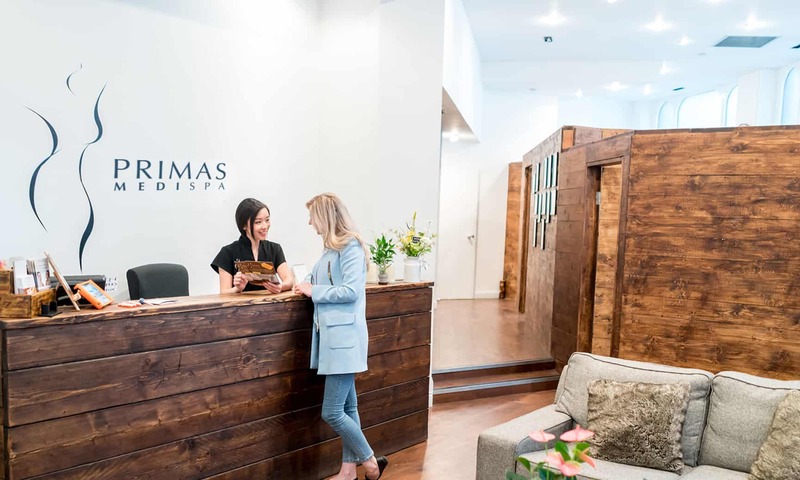 Primas Medispa sits in the heart of Central London and provides a tranquil and luxurious hair removal and skin treatments for all its customers. The brain child of two cousins “Primas” which translates as “cousins” in Columbian brings a distinctly Latin flavour to your treatment and promotes the feeling of body confidence. Affordable luxury in the heart of the Capital. Book an appointment with one of our professionally trained staff today! Book with us for a free, no obligation consultation with our amazing, friendly staff. This is where we check through your medical history, assess your skin, and your hair to ensure you are suitable for Laser Hair Removal. This is then the perfect time for us to have a chat and answer any questions you may have regarding the treatment. You may then need a patch test (also, free of charge), this is vitally important as it allows us to test your skin for any potential sensitivity from laser treatment. This will also make sure you are a suitable candidate for treatment. It couldn’t be easier, simply book a free consultation today with one of our experienced skin practitioners. Get started with your laser hair removal journey, and begin a life that is both hair free and care free. Beautifully smooth, clear, hair-free skin. Reduces time spent at the beauty salon or removing your hair at home. Eliminating issues and irritation with ingrowing hair. Clean shave the area prior to coming in for treatment. Relax and let our friendly staff take care of you. Thanks to the technology we use here at Primas Beauty Spa, there is no need to put off your laser treatment during the summer months. Furthermore, if you are lucky enough to have built up a nice brown sun tan, you can get Laser Hair Removal treatment with us, no problem. Primas Beauty uses one of the most powerful, high-speed technologies that distributes gentle pulses of laser light into your hair follicles. The heat destroys and penetrates each strand by going straight to the hair's root. Because the follicle is destroyed, it will be unable to produce new hair. This means that choosing the right laser hair removal procedure would achieve permanent results and unwanted hair would be a thing of the past. At Primas Beauty Spa we only use the state of the art equipment so your always in good hands. With the MeDioStar Next PRO’s variable pulse lengths (up to 400ms), it allows the treatment of all skin types (I to VI), including those golden sun worshippers. The adjustable pulse duration combines with skin cooling which prevents thermal damage, such as burning to the epidermis. We have your skin’s care in mind throughout the whole treatment process. Our new 360° skin cooling system allows a highly efficient pre-cooling of the epidermis, protecting your skin from the risk of burns and allowing the treatment to be administered in any direction. We use the MedioStar NeXT PRO XL, the ultimate technology in fast and effective laser hair removal. This is most advanced system on the market. With 2,400 W of power, our machines ensure greater skin penetration with very short pulses, allowing us to reach even the deepest follicles and guaranteeing, the best possible results. Even those stubborn hairs will vanish.